TENRUN Pet Shower Sprayer Massage Brush,Dog Cat Long Short Hair Shower Head Grooming Brush with ON-Off Switch Anti-Slip Handheld Bathing Tool Universal (Blue) by TENRUN at People For Pets. Hurry! Limited time offer. Offer valid only while supplies last. Professional pet massage shower head pet grooming brush prevent from skin disease. ★Made from silicone and ABS environmental friendly materials,soft design won't hurt pet or human skin. ★Multi-functional and water saving design toggle the flow of water with one button to control ON/OFF,has silicone splash-proof cover to aviod wetting you when bathing. ★TENRUN shower sprayer easy to control,the handle of the pet shower sprayer is no-skid and comfortable can be operated entirely with one hand and toggle the flow of water with a on-off button in your this palm. 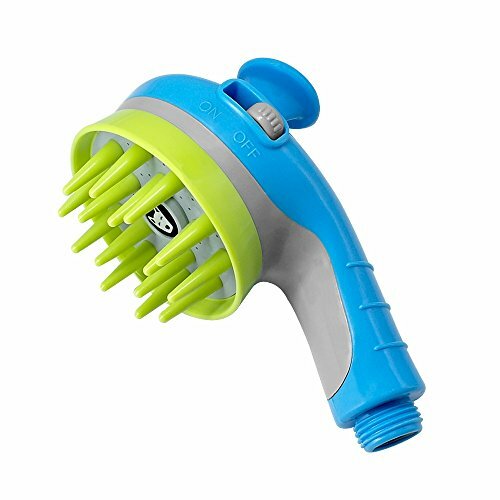 ★Simple and convenient ,sprayer tool connects easily and directly to any type of shower hose,one pet shower sprayer massage satisfy all your needs for dog cat long short hair washing and grooming. If you have any questions about this product by TENRUN, contact us by completing and submitting the form below. If you are looking for a specif part number, please include it with your message.